After we completed our series of games and exercised with the community we were faced with a wonderful problem... we have a lot of information to dig through. We had SD cards full of pictures of lot diagrams. We had pages of notes and gigs of movies. Thankfully, we also had Chris. Chris dug through the data and, being the graphically organized man he is, laid out the results so that they could be quickly understood in a visually pleasing format. We could now look at all the data in one place and make connections between different concepts that were explored in different games. The result is that we could let the ideas of the community drive the design rather than making assumptions about how the community would like to live. Below are a couple of graphics showing the results of the lot and village exercises mentioned previously. 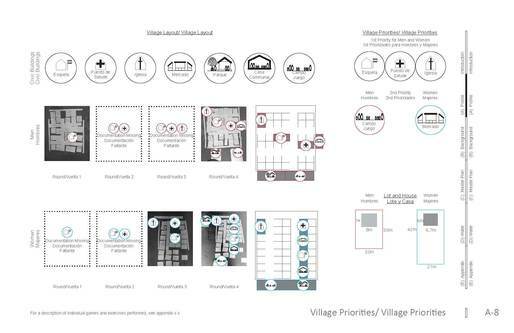 The sheet above shows some of the results from the village priority game. We see here that the highest priorities for this community is to have a health post, school and church in their community. We also had the men and women show us their optimal lot and house size. Not quite as big a difference as we had seen in other villages but still illuminating. Above we see the results of the voting game where we were looking to learn how people wanted their lots configured. Here we see that the majority of people want the house close to the street with the kitchen out back and the latrine far away. In the women's group, we saw that the-close-to-the-street / far-from-the-street was about 50/50 so we have that called out as well. Please feel free to check out more of our work at The Global Studio. 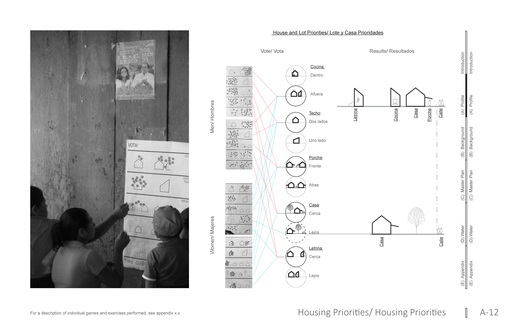 We want to share the community based design process for our most recent Agros project. The project is a rural farming village based in the Matagalpa region of Nicaragua. Agros' mission is to create sustainable living environments for former tenant farmers. Our blog will lay out how we at The Global Studio partnered with Agros and helped to turn community exercises and input into a new village.